The Temple Mount is a religious site in the Old City of Jerusalem. It is a holy place in Judaism and Islam. In Judaism it is the location of the two Jewish Temples, and is believed to be the place where Adam was born, where Adam built an altar for God, where Cain and Abel offer their sacrifices, and where Abraham offered Isaac as a sacrifice. In Hebrew it is called Har haBáyit (הַר הַבַּיִת) or Har haMoria (הַר הַמוריה). In Islam, the Temple Mount is believed to be the place where Muhammad ascended to Heaven. It Arabic it is known as the Haram (الحرم الشريف, al-Ḥaram al-Šarīf), which means "Noble Sanctuary". It is also associated with Biblical prophets who are venerated in Judaism, Christianity and Islam. ↑ "TEMPLE IN RABBINICAL LITERATURE - JewishEncyclopedia.com". www.jewishencyclopedia.com. 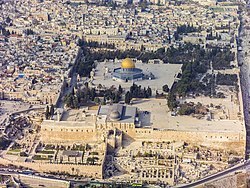 Wikimedia Commons has media related to Temple Mount. This page was last changed on 26 February 2019, at 06:33.